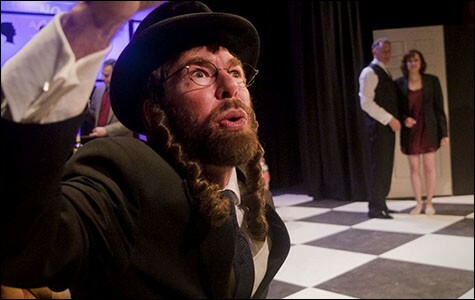 Stanley Spenger plays a drunk and philosophizing rabbi. You'd think the combined wits of Woody Allen, Ethan Coen, and Elaine May would make for some terrific and neurotic theater. And on a cosmetic level, the three one-acts that make up Relatively Speaking by the Actors Ensemble of Berkeley do succeed, but the plays' artistic currency as a whole is something of a mixed bag. Each mini-play had its surprising and disarming moments, and there were many scenes when the audience's laughter drowned out the actors, but all told, the amusement never leads to anything substantial or sticking, the theatrical equivalent of consuming three consecutive meals of pancakes. Filling? Yes. But also one that leaves the palate wanting. Which is not a bad thing. You will not find me turning down pancakes anytime soon (or ever). The point is this: Come to Relatively Speaking to be amused, and you'll have a fine time. Come for anything more than that, and well, prepare to pass the syrup. At its most pronounced, the plays are all ruminations on families: how they shape us, how they ruin us, whether the apple really falls far from the tree, and so on. The first, "George Is Dead" by Elaine May, and directed by Susannah Wood, was by far the best. Carla (Erika Bakse) is waiting for her husband to come home after a fight they had earlier only to be greeted by Doreen (Christina Stoffan), a well-to-do and self-absorbed woman whose husband George has just died. Carla's mother nannied Doreen years ago, though the two are hardly acquaintances, let alone friends. As Carla struggles to be sympathetic toward Doreen's increasingly manic and annoying requests in the wake of the tragedy, ("These Saltines are too salty. Would you mind scraping the salt off of them?") we also learn that Carla cares so much about helping people like Doreen that she ends up neglecting her own husband, Michael (played with adept and brusque huffiness by Aren Haun). Stoffan's acting is boss, especially in showcasing all of Doreen's childish and delusional tics, and while you want to hate her, you can't because she's like a pampered puppy who doesn't know any better. "Talking Cure" by Ethan Coen, and directed by Michael Cohen, is about a hospitalized mental patient, Larry (Dominick Palamenti), and his beleaguered and ineffectual shrink (Geoffrey Colton). Over the course of several sessions, the doctor tries every conceivable way to get Larry to talk about his "problem" (i.e., his assault of a woman at the post office), ultimately getting nowhere. The play is more like an SNL skit than a one-act, and Palamenti and Colton play their limited roles with Abbott and Costello-esque panache. But that's about as far as it goes. Then the lights dim, the couch changes positions, and suddenly Larry's parents (Palamenti again and Meira Perelstein) are fighting while Larry is in utero, a scene which was presumably to provide insight into Larry's erratic and shouty psyche, but ended up being mostly disjointed and mildly confusing. Closing out the evening was "Honeymoon Motel" by Woody Allen, directed by Colin Johnson. They say art imitates life, but in Allen's case, it more often than not imitates his infamous decision to marry his adopted daughter. This was certainly the case in "Honeymoon Motel," where a bride, Nina (Zara Benner), leaves her would-be husband Paul (David Koskza) to be with his father Jerry (Peter Weiss). Jaunting alongside the unconventional love triangle are a number of cliché stock characters, including a drunk and philosophizing rabbi (Stanley Spenger), a cuckolded husband and his unabashed wife, and a pizza delivery sage (Cameron Aiello Dodd) who gives the final monologue in a true Kevin-Smith-as-Silent-Bob moment, about how everyone should just shut up and let Woody, I mean Jerry, live the life he wants to live. 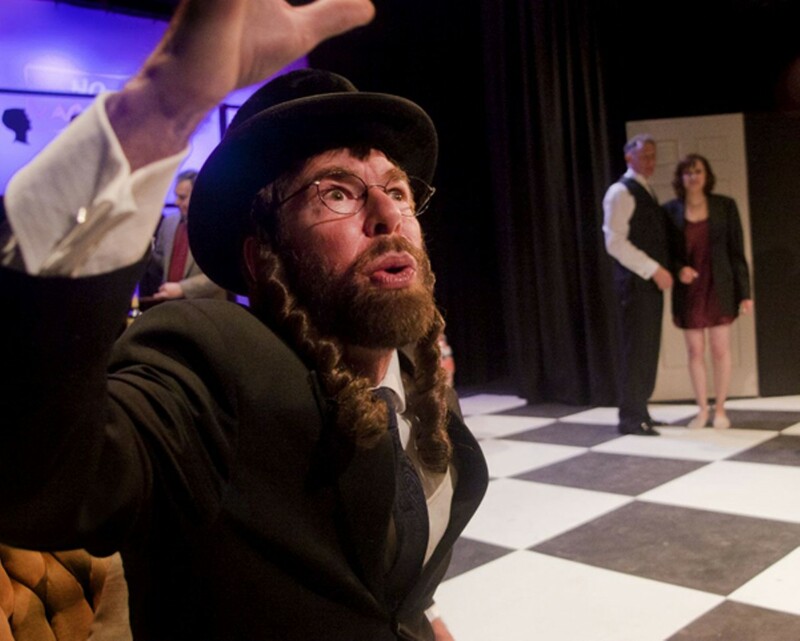 The resulting zoo is full of belly laughs and oddball Jewish humor, but, again, that's about where the matzo ball soup runs dry. To beef up the set transitions, which mostly consisted of moving a couch from one side of the stage to another, the stage crew made a game of it by elaborately gesturing, twirling, and otherwise making the process a performative dance for the benefit of the audience, which mostly seemed to appreciate the theatrics. Props go to the Actors Ensemble for making the relative gimmicks of Relatively Speaking into something entertaining, if not consequential. Consider it one more starchy, post-holiday treat before your New Year's theater resolutions begin in earnest. Editor's note: The previous version of this story misspelled the last name of actress Zara Benner. This version has been corrected.